The rich black soil of fields produces some of the finest potatoes you'll ever try. We typically grow 6 or 7 varieties each year, such as Early Nugget, Red, Yukon and Russet. 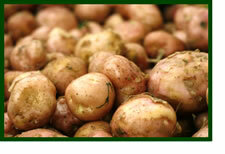 Our nugget potatoes have a sweet earthy flavour and can be boiled, steamed, barbecued or pan-fried. BC potatoes are the largest field production crop in BC! In one year, the world grows enough potatoes to cover a 4-lane highway circling the world 6 times! Mr. Potato Head was introduced in 1952 and was the first toy to be advertised on television. Wash well before using and clean off any loose skin. Do not peel the remaining skin.